Our partial dentures at Thompson Suburban Dental are customized to match and work with your patient’s remaining teeth. We are pleased to offer both cast metal and flexible partial denture options, depending on your patient’s specific case requirements and personal preferences. 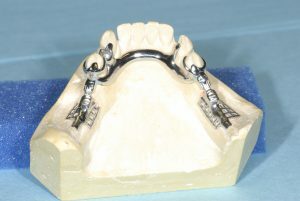 Our cast metal partials are all fabricated with Wironium® and are designed for optimal retention and enhanced esthetics. Wironium is a patented cobalt-chrome alloy with properties similar to that of Type III gold. This unique composition allows Wironium to be more flexible and less breakable when it comes to RPD options. Wironium partial dentures fit right the first time, have clasps that are virtually unbreakable and minimize patient chair time, which leads to more delighted patients. We finish our cast metal partials with heat-cured Lucitone 199 and your choice of teeth. 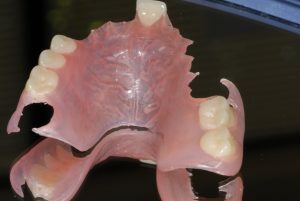 You will be proud to provide these beautiful partials to your patients. Valplast is a flexible denture base resin that is ideal for partial dentures and unilateral restorations. The resin is a biocompatible nylon thermoplastic with unique physical and esthetic properties that provide unlimited design versatility and eliminate the concern of acrylic allergies. Valplast’s injection process adapts well to both hard and soft tissue. The translucency of Valplast blends naturally with your patient’s tissue and surrounding dentition. Patients love the life-like esthetics of Valplast and appreciate the resulting new-found confidence. No matter what your patient’s denture needs are, we’ve got you covered. Contact our denture department with any questions or to discuss your patient’s options.